Coleraine chairman Colin McKendry celebrates the club's Irish Cup success last season. Coleraine boss Oran Kearney celebrates Irish Cup success. Stephen O'Donnell lifted the trophy as Coleraine landed their sixth ever Irish Cup title. Coleraine's manager Oran Kearney before the final whistle at today's game at the National Stadium, Belfast. 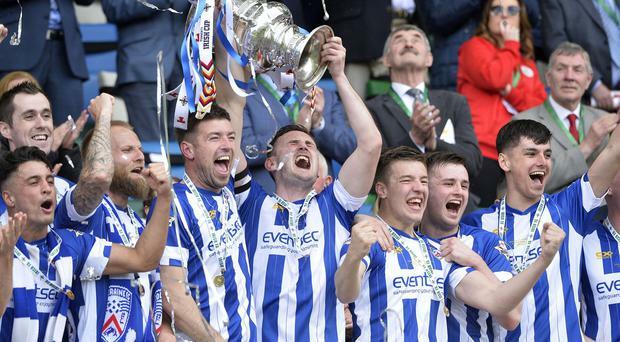 Coleraine have won the Irish Cup for the sixth time with a 3-1 victory over Cliftonville. 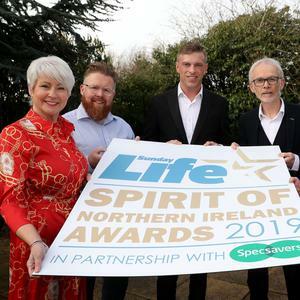 With the game tied at 1-1, former Linfield man Aaron Burns, who signed for the Bannsiders in January, came off the bench to net in the 78th minute and Eoin Bradley then sealed Oran Kearney's first major trophy as Coleraine boss. The Reds still have not won the trophy since 1979. After a tight first half, Darren McCauley rocketed Coleraine into a 50th minute lead, blasting an upstoppable effort into the top corner from Aaron Traynor's cross. They led for just five minutes as Cliftonville equalised with a goal just as impressive. It wasn't as spectacular a finish - Rory Donnelly converting from close range - but the build-up was superb from Conor McDonald, surging through midfield with a strong run and crossing perfectly for the striker to score. That cleared the path for Aaron Burns to put his side ahead and become only the sixth substitute ever to score in an Irish Cup final with a well-timed run, latching on to Eoin Bradley's flick. In injury-time, Bradley romped clear to cap the win with a deserved goal, chipping a finish over Brian Neeson.